The Waikiki Holiday Parade commemorates Pearl Harbor by honoring survivors and veterans in memory of the attacks from December 7, 1941. Local Hawaiian bands, marching bands from the mainland, military units, local officials and dignitaries march down torch-lit Kalakaua Avenue along Waikiki Beach. It is held annually the Friday following Thanksgiving Day and hosts thousands of spectators, residents and visitors alike. 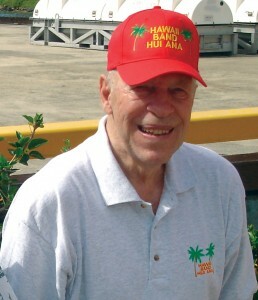 With very heavy hearts we share that Jake Peppers, our dear friend, colleague, and founder of the Waikiki Holiday Parade, passed away on December 1, 2015. We will continue to carry on the tradition of the Waikiki Holiday Parade under the strict guidelines that Jake would expect. Watch below for regular updates on newly accepted bands. The following mainland bands marched in the 2016 parade, commemorating the 75th Anniversary of the attacks on Pearl Harbor.